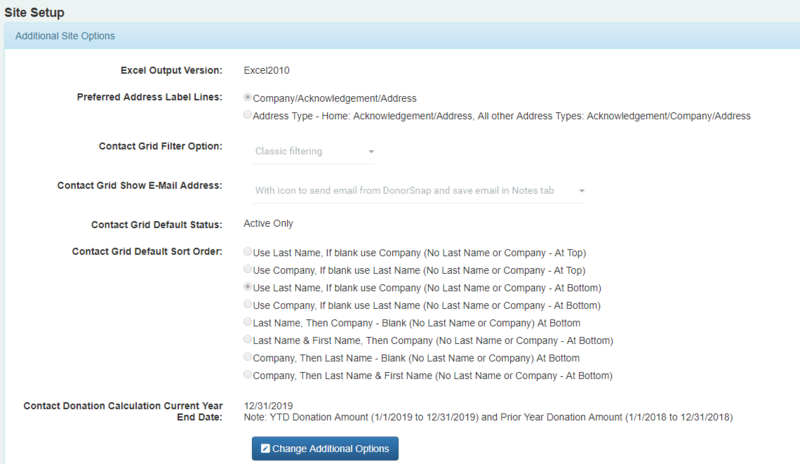 Set additional site options that allow you to change how some of your pages and fields function in DonorSnap. Contact Grid Filter Option: By default the filter allows you to type in a name to the Grid options. Choose “Advanced” to allow for multiple filters on one field. Contact Grid Show Email Address: On the Contact Listing grid (Community > Contacts) the Email addresses will show an icon (click the icon to send an Instant Email). Change it to Text Only, or a LINK so it will open your default email instead of DonorSnap’s internal email.